My poop bag share station after ten months on a Seattle utility pole. BuildASign.com made making my durable, plastic signs simple and fun. They have an almost overwhelming amount of templates to choose from. There is an easy option to start from scratch and make a fully custom sign, including uploading and layering photos or logos. I chose a simple BuildASign.com template and worked to make my desired Scoop That Poop words fit. Once the words flowed, it took just minutes to line everything up on the sign, preview and order. My signs came surprisingly fast, ready to be put up with my community poop bag share station. First, though, the outdoor poop bag holder and utility pole needed a little clean up. Ten months had been surprisingly kind to my community poop bag share station but it was being held up only by the top zip tie. The bottom zip tie had come loose and most of the staples were gone. After tidying up the utility pole and reinforcing the poop bag holder, I stapled and nailed up my new BuildASign.com sign. I removed the unstuck staples from the loose (lower) zip tie for proper, safe disposal. While I was at the utility pole with pliers, I removed some other unused staples and nails. I re-stapled the loose (lower) zip tie and reinforced the staples on the upper zip tie. Huxley, Brychwyn and Wilhelm admire their community poop bag share station handiwork. Since this outdoor poop bag dispenser had stood the test of time and endured the elements in addition to being accepted and used by dog walking neighbors, I decided it was time to add more community poop bag share stations to the neighborhood. I had chatted with a neighbor many months ago about the unscooped dog poop problem she was having in the green space behind her house. This neighbors vinyl fence is exactly the right place to test out the other way of hanging my outdoor poop bag dispenser is designed for- around a pole! The last time I had walked past this neighbors fence, she had taped a sign up asking people to obey the law and scoop that poop. 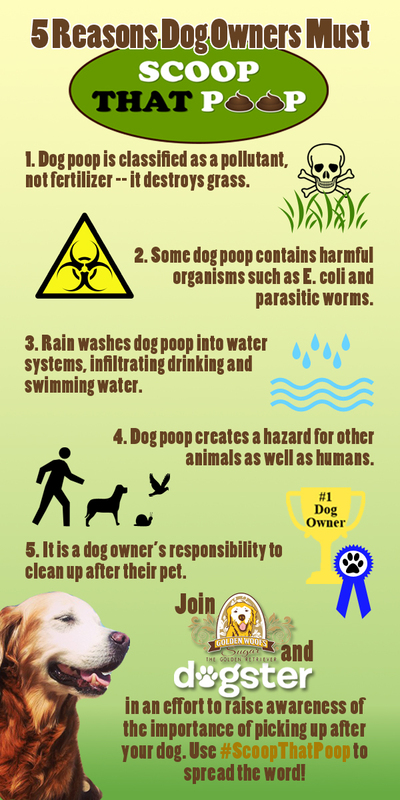 Yet it had since fallen down so I added a "5 Reasons Dog Owners Must Scoop That Poop" sign. I told the neighbor that this sign would not last long and recommended she check out BuildASign.com for something more durable. My next mission was to put up another community poop bag share station at a nearby park. The park itself is usually poop pile free but the blocks surrounding the park can be pretty gross. I think that an obvious and centrally located dog poop bag dispenser could be a big help. Both the do-it-yourself water bottle poop bag holder and the sign from BuildASign.com had to be attached to a pole at the park with zip ties. This is definitely a dog poop bag share that I hope will last and gain active community participation. I am indeed very pleased that our first dog poop bag exchange has been a success. Hopefully our two new ones will be just as productive. Maybe someday everyone will know how important it is to scoop that poop, they'll never forget bags and the neighborhood will be clean! What would your BuildASign.com Scoop That Poop sign say? Wilhelm admires the new poop bag share station at our neighborhood park. Cascadian Nomads received complimentary product from BuildASign.com in exchange for our honest review. We were not otherwise compensated for this post. Cascadian Nomads only shares information that is relevant to our readers and all opinions are always our own. *Cascadian Nomads is hosting this $25 BuildASign.com giveaway, will choose (at Random.org on July 28th) and notify the winner (via e-mail) but BuildASign.com is responsible for prize fulfillment. BuildASign.com offers more than just signs and the winner can use the $25 towards any product. Cascadian Nomads Scoop That Poop sign and any comment ideas are simply meant to inspirational. If you missed our post on how to make your own versatile community poop bag share station by re-purposing a plastic water bottle, check it out here. Did you make one? Please let us know how it has worked out! Thank you to the Scoop That Poop blog hop hosts Sugar the Golden Retriever, My Pawsitively Pets and Oz the Terrier. Please join us in raising awareness about the importance of picking up after your dog by joining the hop or sharing the #ScoopThatPoop wherever you can. That is a great idea and not only helpful but prompts people to remember to pick up. Nice one and we love the sign too. Bravo to you. Have a terrific Tuesday. Thank you Molly! So far our neighborhood has been cleaner. I hope this idea inspires everyone! Well done - it is awesome that people are finally using it. I'm glad it has caught on. I hope it continues! I LOVE the new signs for your poop bag share station!! And I love how successful the share station has been...so much so, you are adding more! Well done, pals. I had to share your poop bag share station on social media because it is so great! Thanks for sharing Oz. We hope to see these stations everywhere! Technically, the sign and station on the utility pole are illegal here in Seattle. Signs are only supposed to be posted for a limited time. But since I check on it, keep it looking nice and from turning into litter, I doubt it will be removed. Stickers are a good idea- anything that helps people remember enough clean-up bags every time they go out! What a great idea. Love it. Such a simple and easy thing to do for doo. This is such a fantastic idea. I know several places that I should put up similar signs. Thank you. Jason thinks there has been less poop on the block surrounding the first station. I hope the same will be true for the new ones and that they might help your neighborhood too! Wow Bethany, your sign looks awesome! I'm sure no one will miss that. I can't believe it's been 10 months since you first made them, because I DO remember it. Thanks for the update and letting us know how they are working out. I have used BuildASign before, but had business cards made. Time flies, doesn't it? There were times over the last 10 months that the dispenser was empty and I thought if it stayed that way for more than a few days, I would have to take it down. Hooray for it working! That is a fantastic idea!! I've been wanting to do something like this for the complex that we live in. I hope you'll let us know how it turns out! This is a fantastic idea! I'm sitting here trying to think of where we need one - definitely in our old neighborhood. I can think of places along the Centennial Trail that can use a poop bag station. Parks and popular dog walking trails should all have lots of these poop bag share stations! I'm glad this idea inspires and I hope you'll let us know how your stations turn out. I'm back to enter your giveaway! I have a project I'm doing where this would come in handy so count me in. I think if I were to build a dog poop sign, it would definitely say #ScoopThatPoop! What a great idea! I love that you're recycling as well. As Sugar said, stickers would be a great idea! We love BuildASign, good luck everyone! I love your initiative! We moved from D.C. suburbia to rural NC a few months ago, and are dearly missing "our" poop stations...the lack of those in combination with the stray & loose dog problem out here are very frustrating. Sigh. I pride myself in ALWAYS carrying plenty of poop bags on me and NEVER leaving a pile of poop behind. Wish more people in our area felt the same way! I admit that I have mistaken what plenty of poop bags would mean but I have always gone back for any poop accidentally left behind. So many well meaning people can mistakenly forget bags and it i nice to have a little bit of help sometimes! This is such a good giveaway, Bethany. When would you be having your next one? Thank you Selbys! I am on a blogging break but hopefully when I return there will be more great giveaways on the blog!